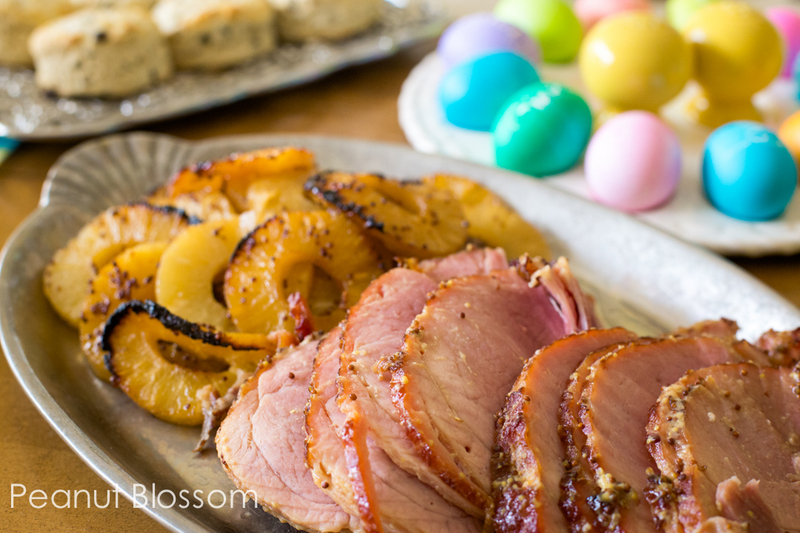 Even a beginner can handle this easy pineapple and mustard glazed spiral ham recipe for Easter brunch. Sweet and juicy, savory and tangy, it’s a dish so good, your grandma will swoon. 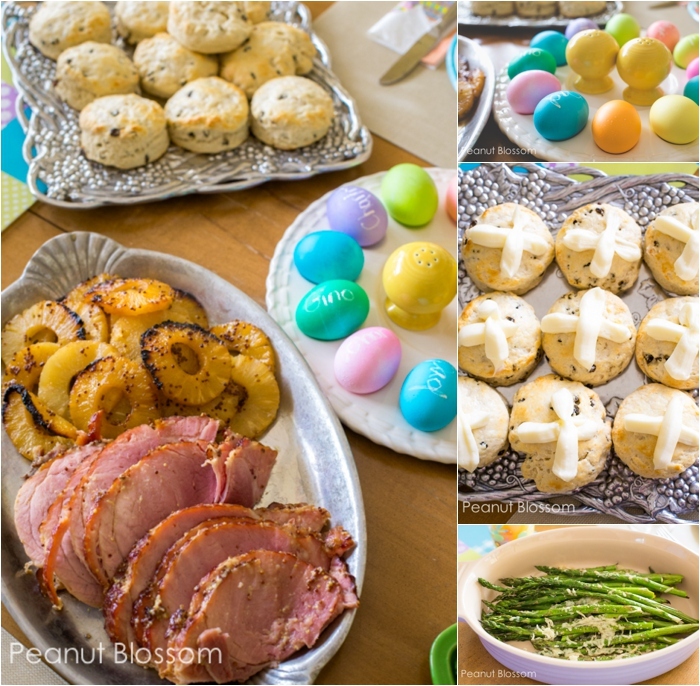 As a young girl I would cringe when Easter and Christmas rolled around and my mom would make ham. Sorry, mom. No offense but that big pink slab of meat was possibly the most unappealing thing to hit our holiday table. Why bother when there were all those yummy side dishes, not to mention my basket FULL of chocolate goodies right over there. 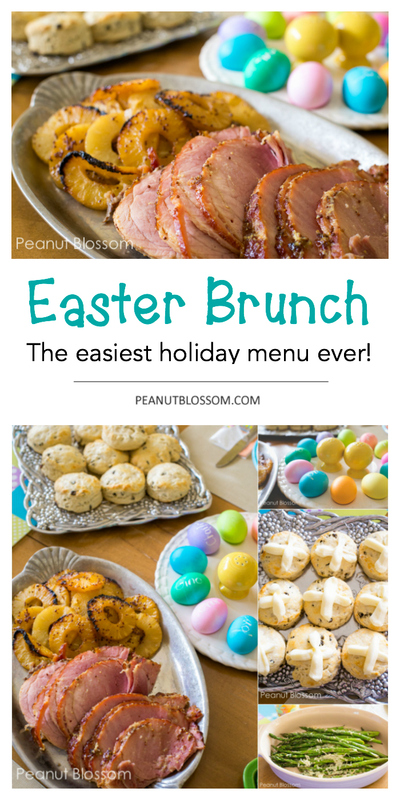 . .
A few years ago as I prepared for hosting our own first Easter, I stumbled across a recipe claiming to be the very best holiday glazed ham ever. I was skeptical until I saw the ingredients included pineapple and mustard. Then I noticed something new. . . it required a SPIRAL ham. This was not something my mom ever used–she worried the slices would dry out when baking so relied on a regular ham. The trouble with a regular ham, however, is it is nearly impossible to slice it as thinly as I prefer! 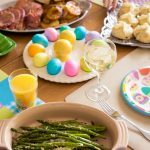 One round with this glazed spiral ham recipe and it has become our holiday staple for both Easter and Christmas day. It is so well known in our home, even Handyman Tim has had a couple turns at preparing it himself when I fell desperately sick at Christmas. So yes, it is just that easy. Even Tim feels comfortable prepping it. But most importantly, everyone in the family loves it. Even my mom who is now a spiral ham convert. It is flavorful, tender, juicy, and those caramelized pineapple rings are the very best part. YUM. We decided to skip the potato side dish because the kids still don’t like potatoes and Tim and I were more than content with the rolls and biscuits. 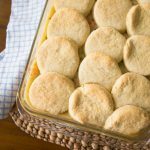 When the ham comes out of the oven, the biscuits go in. When the biscuits come out, the asparagus goes in for 12 minutes. Carve and plate the ham 5 min before the asparagus comes out and everything is ready to be brought to the table together! Preparing the glazed spiral ham is so easy, too. Just don’t forget to have toothpicks on hand. You simply line your baking dish with tin foil to help with clean up. Place the ham cut side down and brush with the glaze. Cover it with pineapple rings held into place with toothpicks and then brush with the remaining glaze. 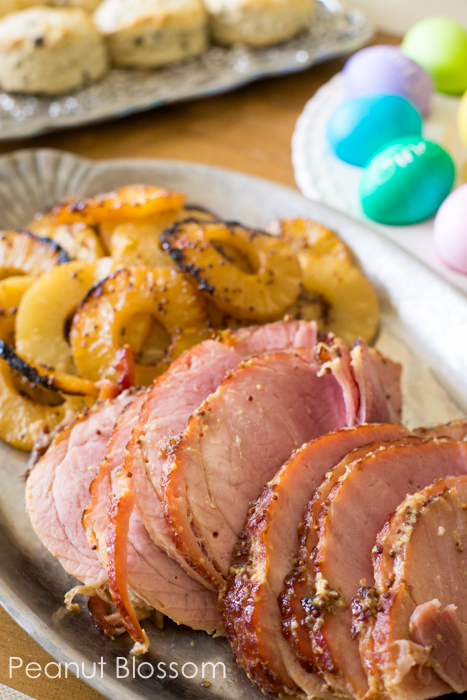 This sweet and juicy mustard glazed ham is the perfect Easter or holiday recipe. Line a large roasting dish with tinfoil to help with clean up. Remove the ham from all of it’s plastic wrappings and place cut side down inside the pan. Open the pineapple cans and drain the juice into a measuring cup. Reserve 3/4 cup of the juice. Combine the pineapple juice, brown sugar, and both mustards in a bowl. Brush the ham and pineapple rings with the remaining glaze. Wrap the outside of the ham in tin foil as tightly as possible. The toothpicks will poke through, that is just fine. You want the ham covered so it doesn’t burn in the first stage of cooking. Leave the glazed, wrapped ham sitting on the counter for an hour and a half. This brings the ham to a more even temperature for baking. Remove the ham from the oven and raise the temperature to 450 degrees. 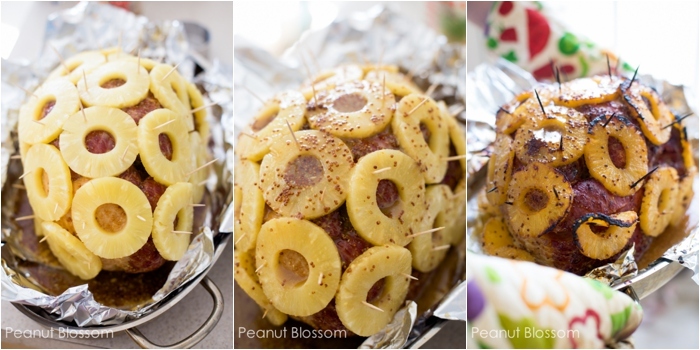 Remove the tin foil covering and baste the ham with the juices from the bottom of the pan. Return to the oven and bake for an additional 30-40 minutes. Glaze the ham a few times during this last step to keep it moist and get as much of the sticky glaze on top as possible. The pineapples will begin to char — don’t worry, those are the tastiest parts!! Just watch so they don’t flat out burn. Remove the ham from the oven, baste one more time, and tent it with tin foil to keep it warm while it rests for an additional 30 to 40 minutes. This is when you can add the remaining side dishes to the oven to complete your menu. Total time from removing it from the fridge to hitting your table ranges from 5 – 6 hours depending on the weight of your ham. « First visit to the Mint Museum in Charlotte: Is your child ready? Do u think it would be OK to use cherry’s along with the pineapples also? This excellent website certainly has all the info I needed about this subject and didn?t know who to ask. I made this and it was the most delicious ham me and my family have ever eaten. Thanks for the recipe! 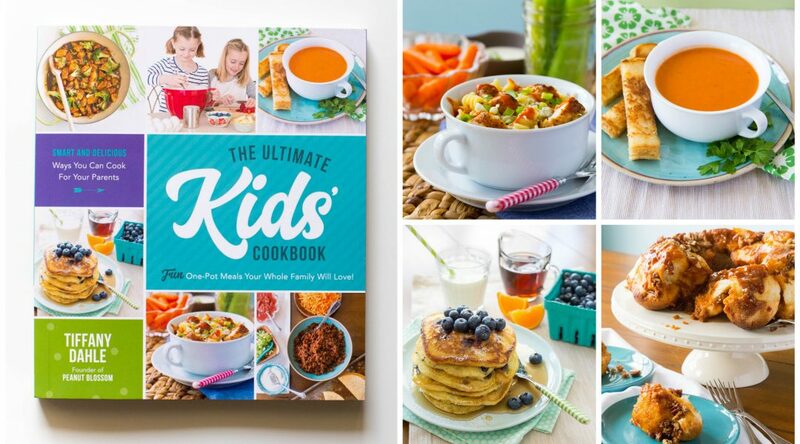 Have you ever made this in a slow cooker or crock pot?